Chicken Tortilla Soup Recipe — When it Rains Paper Co. | Colorful and fun paper goods, office supplies, and personalized gifts. I don't know what a "bomb cyclone" is but honestly I want nothing to do with it. (And that's coming from somebody who loves cold weather.) I just want to know what it feels like to be warm again and stop fussing over our outdoor plants and water faucets. In an effort to make the best of it, our 2018 has been filled with lots of soup and lots of wine. (Probably equal parts. Oops.) In the past couple of months, we've made everything from taco soup and chili to chicken noodle and vegetable. 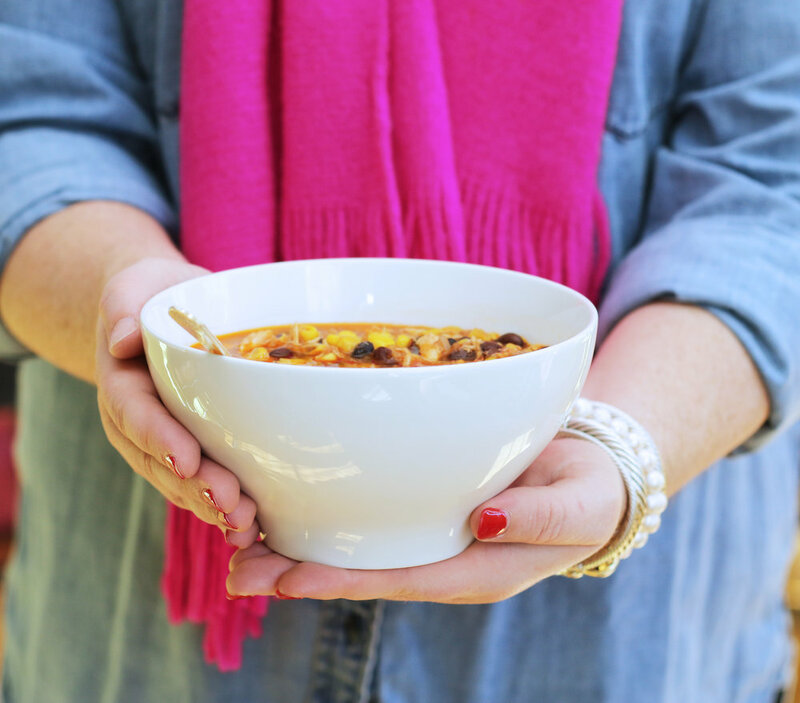 Because January is National Soup Month, I thought I'd share one of our favorite soup recipes! Kat and I were both shocked when we realized we have never blogged about this recipe because it's actually one of our all time faves. You can make a big batch and freeze it into individual servings, it's actually pretty healthy, and it's delicious! Preheat oven to 450 degrees. Heat oil in a Dutch oven over medium heat. Add chicken and cook for 3-4 minutes or until opaque. Add onion, garlic, cumin, salt, chili powder, and red pepper. Cook 1-2 minutes, stirring frequently until garlic and spices are fragrant. Stir in broth, corn, beans, and tomatoes (with juice) and bring to a boil over high heat. Reduce heat, cover, and simmer for 15 minutes. Meanwhile, spread tortilla strips in a single layer on baking sheets. Bake for 5 minutes, stirring until crisp and lightly brown. Stir cilantro into soup (neither of us like cilantro so we always leave this off) and ladle into bowls. Top with tortilla strips. If you're not too worried about the calories, you can always add a dollop of sour cream or shredded cheese to the top! Note: This makes around 4 servings but you can easily double or triple the recipe for more.